The atmospheric concentrations of carbon dioxide, methane, and nitrous oxide have increased to levels unprecedented in at least the last 800,000 years." 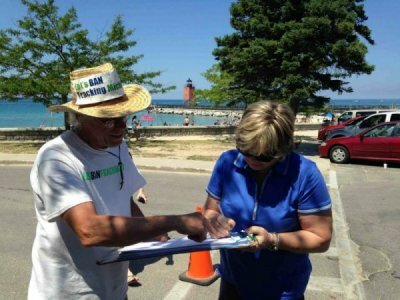 Collecting my 1000th signature in 2015 for the Committee to Ban Fracking in Michigan. Photo: LuAnne Kozma. Increasing magnitudes of warming increase the likelihood of severe, pervasive, and irreversible impacts. Baseline scenarios, those without additional mitigation, result in global mean surface temperature increases in 2100 from 3.7 °C to 4.8 °C compared to pre-industrial levels. Over 800 authors contributed to the IPCC effort. In May 2010, shortly begfore beginning the first of his three terms, now-retiring Congressman Dan Benishek sat for a lengthy telephone interview. At 44:56 he was asked "What is your position on climate change, global warming, whatever you want to call it?" I think it's all baloney. It's all baloney. I think it's just some scheme. I remember there was global cooling back in the 70s. I actually went with that. I just don't believe it. I just don't believe it. I am a scientist. I am a surgeon, I've done scientific research papers. There's a lot of skep-- you have to have skepticism. You have to have reproductive results when you do scientific papers. There's nothing like that in the science that they have. Just spend trillions of our dollars on this unproven science stuff is ridiculous. So I'm against that. I'm against the cap-and-trade. And I'm actually against all this windmill stuff too. If something is fiscally responsible or financially rewarding, then it's going to be developed by people. If you subsidize one industry over another, that's not right. They tax us and then they give people building windmills tax credits. What about the people that are actually just working people? Where is their tax credit? Give everybody the same tax credit, not some special company that happens to be your favorite this year. Benishek's last two Democratic opponents, Gary McDowell and Jerry Cannon, didn't go as far as Benishek, but did advocate (as Cannon expressed it) "expanding production of American oil and natural gas" albeit "responsibly." All of Exxon Mobil's current hydrocarbon reserves will be needed, along with substantial industry investments, to address global energy needs. So "responsible" production means exploitation of "all" hydrocarbons. Well, now we're sitting here with 100 years' worth of supply in natural gas and a continued growth plan. And we need to get that story out to the kids as they make their decisions about our industry. Here we show that market-driven increases in global supplies of unconventional natural gas do not discernibly reduce the trajectory of greenhouse gas emissions or climate forcing. She urged an "urgent transformation" to greener production after top scientists warned on Monday that climate change would damage food supplies, slow economic growth and aggravate the underlying causes of armed conflicts. Limiting global warming to an agreed U.N. ceiling "means that three quarters of the fossil fuel reserves need to stay in the ground, and the fossil fuels we do use must be utilized sparingly and responsibly," she said. The Paris climate agreement dealt with greenhouse gases emissions mitigation, adaptation, and finance. To come into force, 55 countries, representing 55 percent of total emissions, must ratify it. [hold] the increase in the global average temperature to well below 2°C above pre-industrial levels and [pursue] efforts to limit the temperature increase to 1.5 °C above pre-industrial levels. Since then, distinguished scientists are saying that the aggregate pledges of all Paris countries combined, even if actually enacted, are too low to keep temperature rise below 2° C. Through June, the year 2016 was 1.34°C above the average around the end of the 19th century. And even if 2° C were achieved we could still lose the West Antarctic ice sheet, with a resulting sea level rise of 4-12 feet. A new study released by by Oil Change International in September 2016 finds that the potential CO2 emissions from the oil, gas, and coal in the world’s currently operating fields and mines would take us beyond 2°C of warming. And even if coal, cement, and deforestation were stopped immediately, the oil and gas reserves would take the world beyond 1.5°C. Though it won't be easy even if she tries, Hillary Clinton has pledged to meet the Paris goals. But as noted elsewhere she and the people who surround her have low credibility. For its part, the Republican Party has pledged to oppose the Paris goals. If the goals are not met, what then? The predictions of 2014 assessment will come true: global mean surface temperature increases in 2100 from 3.7 °C to 4.8 °C, and severe, pervasive, and irreversible world-wide impacts. There is some good news. An oil industry official told Politico in July "the 'keep it in the ground' campaign [has] controlled the conversation." This is as it should be. The campaign's foremost goal is an upsurge in mass consciousness and activism, which like the civil rights movement of the 1960s will force the government to act. Merely ratifying and implementing the Paris climate accord will not save the planet or the US electorate, but an aggressive campaign might. In short, a very strong case can be made that avoiding dangerous climate change requires giving up growth economics, at least in the wealthiest parts of the world. ... I just don’t think we can make that transition without also fundamentally reorganising our economies and embracing deep post-consumerist lifestyle changes. ... It seems to me that the only way humanity can transition toward a just and sustainable economy is for the richest nations to initiate a ‘degrowth’ process of planned economic contraction, in order to leave sufficient ecological room for other nations as well as biodiversity. Otherwise stated, system change is what we need, not climate change. HR 4535, the Keep It In The Ground Act, with limited exceptions would prohibit the federal government from granting new onshore/offshore leases, or renewing nonproducing old leases, for coal, oil, or natural gas exploration or production in any federal land or waters. Introduced this year, it has 23 co-sponsors. A companion bill, , S 2238 was introduced in the Senate last year, and has 8 co-sponsors. As the old labor anthem asks, "Which side are you on?" The Green Party climate platform calls for the following: a strong international climate treaty; economic policy for a safer climate; repay our climate debt; more efficiency and conservation; clean, green energy and jobs; and clean green agriculture. Read the specifics here. As far as my own activities, I concentrate on stopping or retarding oil-gas development in the state, and have brought several suits along these lines. A subsidiary of Houston's $27B Marathon Oil has rights to nearly 1000 square miles of oil-gas leases under state-owned land, plus additional acreage under land of private landowners. As one commentator has put it, "we may be fixin’ to get ready to see a whole lot of fracking going on in northern Michigan." I work mainly in two related organizations, Ban Michigan Fracking and Committee to Ban Fracking in Michigan. The former is a non-profit which educates people about the need for a fracking ban. The latter is a citizens' initiative to get an amendment to Michigan statutory law on the ballot, to ban horizontal fracking and storage of frack waste in the state. It would also repeal the part of the state's 1939 law which requires judges, juries, and DEQ regulators to "foster" the oil-gas industry "favorably" and "maximize" oil gas production. Starting last summer and to date, I have collected over 4000 face-to-face signatures for the Committee, from voters living in over 70 Michigan counties. The campaign is almost entirely volunteer-driven. Over 800 volunteers have also collected, a few of whom have got far more than I. The number of signatures required to make the ballot is 252,000. The Committee had collected 207,000 as of June 1. That was the deadline for the 2016 election, so the campaign just continued collecting to apply the signatures to the 2018 ballot. The attorney general has ruled in the past this is permissible. We were on track to get the needed number for 2018 well before that year's deadline. The alternative would have been to stop and start collecting anew for 2018, a huge logistical burden. The state has a statute saying canvassers will only accept signatures collected within a 180-day window, a period the Committee had exceeded by June 1. However, according to precedents of the Michigan supreme court and court of appeals, the Michigan constitution prohibits the legislature from imposing any time limit at all on collecting for statutory initiatives. On June 1 we sued for a declaratory ruling setting aside the 180-day window. The argument is straightforward. The legal complaint can be downloaded here, as can the response of the state and the judge's ruling. Instead of contesting the merits of our argument -- which the attorney general previously endorsed in another case -- the state argued the issue was not yet "ripe" for decision because we didn't have 252,000 signatures in hand "yet," and we couldn't prove we would ever get them. The judge accepted this argument and dismissed the case. Of course the whole purpose of a declaratory ruling to head off a controversy before the parties spend time and money. Our research has found not a single other federal or state court in Michigan or the US that, like this one, rejected an initiative case on grounds of ripeness. Our judge plowed new ground. The Committee is appealing, and at the same time continuing to collect. Last year I brought a FOIA case for a landowner against DEQ, concerning a so-called "mineral well," which has extreme confidentiality provisions compared to an oil-gas well. No information will be released for 10 years. DEQ does not consider oil or gas to be "minerals." Drill rig at the so-called "mineral well," October 6, 2015. Photo: LuAnne Kozma. But this well was being drilled into the "Amherstburg" formation, known in the state as an oil-producing formation. In Michigan potash is considered a mineral, and there is a potentially lucrative potash deposit in the state, but not in the Amherstburg. In fact there are no known "minerals" in the whole county, Crawford County. At first DEQ wouldn't even admit it had issued a permit. Then it said the well was not "exploring" for minerals, but "testing" rock known to be mineral. The drill rig, which as of last fall can be viewed here, was used for oil-gas exploration at other wells before and after the well in question. A worker on the site admitted the company hoped to find gas or oil. When drilling was done the company left behind a blowout preventer, something required for gas-oil wells not mineral wells. DEQ did not conduct its own independent examination to see if the rig was really testing minerals as opposed to gas and oil. Instead it just accepted the operator's claim that it was testing minerals. The burden of proof in any FOIA case is on the state, not the plaintiff. Even so, the court denied the FOIA request. We are appealing. 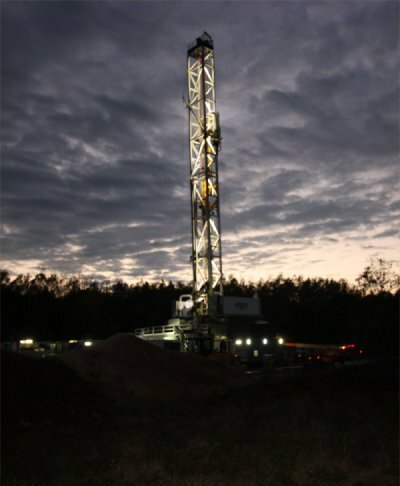 In 2013 I sued DEQ and Encana Oil & Gas (USA) for a landowner for an injunction against 13 US-record-setting horizontal wells in Kalkaska County. They were spaced too close together. The wells in total would have removed 387,660,000 gallons from the below-ground aquifer. At $8 million for each well, the project cost would have summed to over $100 million. The company told the judge "they have to start soon after the first of the year...." The court stopped them. The story of the case is here. Later the client switched lawyers and lost the injunction, but the wells were never actually drilled. Another was a landowner case against gathering lines through the state forest for two frack wells. Encana applied for permits from the Michigan Public Service Commission (MPSC), and asked MPSC to keep the applications secret. One of the lines would be near a nesting site of endangered Kirtland's warblers, prized in Michigan. Encana's environmental impact assessment (EIA) considered conditions only within the 35-foot pipeline easements, but not in the adjoining forest. This, even though cited scientific literature has long established that environmental effects of a line can extend up to a kilometer away from the line itself. MPSC granted the permits. Even as the landowners challenged the lines in court, Encana built them. In 2015 the court of appeals vacated the permits and remanded, exclaiming that failure to consider the claim may result in a "miscarriage of justice". On remand, MPSC declared the EIAs "guesswork" and ordered the company to explain. The company did so, in which the EIA author said he had surveyed the pipeline routes looking for "Kirkland's warblers" during the winter, not realizing they had migrated to the Bahamas. Surveying out-of-season like that requires a do-over, according to a statement in the case of a DNR wildlife expert. There was no do-over. MPSC re-approved the permits and the case is back in the court of appeals. Meanwhile a separate case in the court of appeals challenges the 35-foot DNR easements for the lines, in the face of a 2-inch discrepancy in company information as to the line diameters, and the DNR's longstanding procedure which recommended 20 feet. My first enviro case was a suit which argued that, because frack wells inject millions of gallons of water and sand and chemicals, the wells should be treated under the DEQ's existing rules for "injection wells." These rules include pre-disclosure of certain of the chemicals, and limitation of the pressure under which they can be injected. The case is somewhat complex. The court's opinion can be read here. The bottom line is we lost. But as we requested the court did not adopt the DEQ's reasoning. The opinion did not utilize industry jargon, and instead spoke in ordinary English terms. The statutory definition of an "injection well" refers to increasing recovery from a reservoir. All that means, the court said, is that any well is considered an injection well if the reservoir was already producing prior to injection, and the operator injects fluids to enlarge recovery. The reasoning will come back to haunt the agency in a future case about some new well, if that well is the second or third or any subsequent well which is tapping a particular reservoir.